Details of past BBPlan Committee meeting are available on the Committee Meetings page. Details of previous Newsletters sent out to members, are available on the Newsletters page. * The NHDC Public Consultation on the modified Local Plan finished on 11th April 2019. The final Local Plan from the Local Plan Inspector is expected later in 2019. BBPlan Neighbourhood Planning documents will take into account any relevant changes made by the Inspector to the Local Plan. The NHDC Local Plan consultation finished on 11th April 2019. BBPlan comments can be seen in the Mar 2019 consultation leaflet , with concerns about site BA3. Below is a map showing the BA3 land selected in the original Local Plan, and a second map showing the land selected in the modified Local Plan. The Local Plan inspector will review all comments received, and produce the final Local Plan later in 2019. BBPlan Neighbourhood Planning documents will take into account any relevant changes made to the Local Plan. The Baldock Councillors met at 7.30pm, Monday 3rd Dec, in the Baldock Community Centre. Amongst the speakers, Cllr David Levett gave an update on the NHDC Local Plan. BBPlan also gave an update on progress of the Neighbourhood Plan. Meeting with AECOM at 7pm, St Mary’s Church Hall – to meet the Design team, learn about the design process, investigate & discuss design possibilities, and provide your ideas – all of which will influence the evolving Neighbourhood Plan Design Document. Met with Baldock Councillors at 7.30pm, to present and discuss the current draft Neighbourhood Plan. Some Councillors unavailable to attend that evening. Visit to Baldock by AECOM, to give feedback on the comments received at the Baldock Fair on 19th May. Meeting with AECOM & WYG in London to discuss how best to progress the development of the BBPlan Neighbourhood Planning Design Document. BBPlan hosted a stall during the Baldock Fair on Sat 19th May, where views of residents were gathered as to the design of Baldock, Bygrave and Clothall developments. Residents were encouraged to write their comments (posative & negative) on post-it notes and place them on one of the eleven large boards prepared by AECOM, a planning design consultancy. Each board had a photo showing possible building designs. The stall was shared with the Baldock Society, who also presented old photos of Baldock, in the Community Centre. The Local Plan hearing sessions took place at the Icknield Centre, Icknield Way, Letchworth, SG6 1EF. They started on Mon 13th November, with the last session held on Tuesday 27th March 2018. The inspector reviewed the NHDC Local Plan, and asked NHDC to make some changes. There are plans for another six week consultation period, possibly starting in January ’19, to review the NHDC Local Plan revisions, with the Inspector’s final report being expected later in 2019. – the Examination Library , containing many documents associated with producing the Local Plan. The Baldock & Bygrave hearing sessions were held on Tuesday 6th Feb 2018, at 9am. Only site BA1 was reviewed. The hearing for the rest of the BA sites was re-scheduled to Monday 26th March, 9am, at The Council Chamber, Council Offices, Gernon Road, Letchworth Garden City, SG6 3JF . 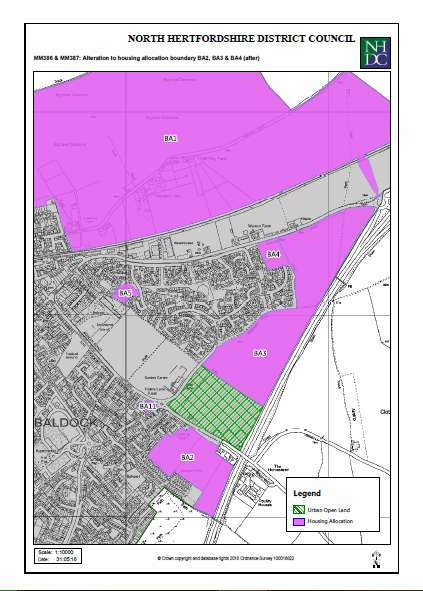 NHDC map of sites proposed for Baldock. * Presentation of results – of 581 responses to the recent Neighbourhood Planning Survey. * The ended with a brief BBPlan 2018 AGM. 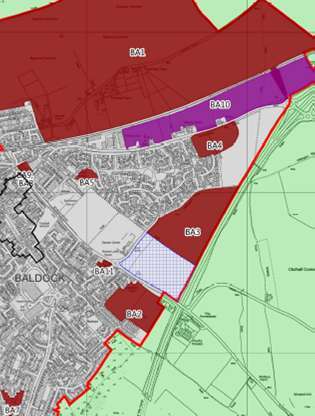 The Survey, to gain views as to how the Baldock area should develop alongside the NHDC Local Plan, closed on 21st Feb 2018. Survey Monkey was used to Complete the survey. The results can be seen in the power-point presentation – Presentation of results . The Survey was originally printed in the four centre pages of the January 2018 edition of ‘On Our Doorstep’, with an online Questionnaire available to download and print, plus a Survey Poster also available to print. HCC employed WYG Consultants to create a draft outline design for the Baldock North & South sites. The HCC Consultation started on 19 Jan ’18 ending on 16 Mar ’18. Letters, dated 19/01/18 were sent to Baldock and Bygrave residents adjoining the Baldock North site BA1, and the Baldock South sites BA2, BA3 & BA4. – HCC 3rd illustrative vision of the Baldock developments, as at Jan 2018. A presentation was made to the residents, at Bygrave Church, 8pm. HCC held two follow-up consultations – on Fri 6th Oct, 3pm to 8pm, and Sat 7th Oct 11.30am to 2.30pm, in the Baldock Community Centre. Details of the October HCC Consultations were available on their website – www.baldockconsultation.co.uk . The full HCC 2nd revised proposals can be seen in the baldock-consultation-boards-6-7-oct-2017 PDF, as at 6th Oct 2017. HCC asked the public to provide, by 14th Oct, their comments on the possible plan in their survey Questionnaire. Details of the first consultation in July are available further down this page. 20 members of the BBPlaning group walked from Tapps Garden Centre, around the proposed residential areas BA2 & BA3. photos and video are shown on the Photo & Video page . Details of the first walk on Sat 8th July around BA1 are shown further down the page. Alessandro Marsili of Affinity Water presented information re the Ivel Springs headwater, the levels of underground aquifer water available, and info on the water supplies for the proposed extra 5000 plus houses for Baldock and Letchworth. (Presentation was in Baldock Community centre.) Affinity Water assured the Councillors that water would be available, possibly piped in from other areas, as part of their long term planning for Hertfordshire. At the NHDC Cabinet meeting on Tuesday 25th July, the Cabinet members unanimously approved the Baldock, Bygrave and Clothall Neighbourhood Planning Area. 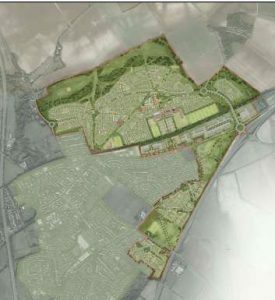 HCC (Hertfordshire County Council) have developed some very early proposals for the Baldock North and Baldock South East housing sites. The first round of public consultations were held on Tues 11th July (3pm to 8pm) and Sat 15th July (10.30am to 1pm). HCC are planning follow-up consultations in early October. Both July events were held at the Baldock Community Centre in Simpsons Drive, Baldock, SG7 6DH. More details were available on their website – including the ability to view and download a questionnaire and send back comments – www.baldockconsultation.co.uk/contact-us . The website held details of the 12 information Boards used in the first Consultation presentation, including a map of the proposed roads and developments (Board 11) – see PDF file – HCC-neighbourhoods-for-baldock-1st-public-exhibition. The first illustrative site diagram can be seen on page 11. 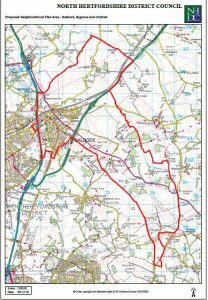 * Sat 8th July ’17 – First Walk around Local Plan areas BA1, BA10 and BA4. 12 members of the BBPlaning group, including 2 from Bygrave, walked around some of the land that NHDC plans to develop. The walk started 2pm at Baldock Station, up Icknield Way East, and along Royston Rd to the bypass roundabout (with the proposed industrial area BA10 on the left, and the proposed 95 new Clothall houses BA4 on the right). From the roundabout, the group walked on the public footpath past the potato crops, to the railway foot crossing. Then around the crops, and up through the ripening Barley field to Bygrave. Down through Bygrave (which is currently light-pollution free) to the Ashwell Road bend, and along the Bridle path back towards Nth Road. Over the ridge line path across BA1 (2800 houses) , and down to Bygrave Road, returning to Baldock Station at 5pm. Lots of photos and video were taken – see Photo & Video page. * Wed 28th June ’17 – Notification received from Louise St John Howe (NHDC) that the Inspector in London is currently appraising the Local Plan. As there are a large number of representations this is not likely to be for a couple of months, but information on the examination is kept up to date on the Council webpages. * Thu 8th June ’17 – Public Meeting for all members of BBPlan group, held at St Mary’s Church Hall from 7pm. This was part of an ongoing process of consulting the public about the development of the Neighbourhood Plan. We looked at information gathered on May 13th and developing a strategy to take our research forward. For full details of the meeting discussions, see June 8th 2017 meeting notes. * June ’17 – Received notification from NHDC that the BBPlanning Group’s application is now on the NHDC Neighbourhood Planning webpage, under Current Consultations. The Consultation period runs from Friday 9 June to Friday 7 July 2017. The Stall was manned by the committee and extra volunteers for a six hour period. Around 200 individual comments were collected, and 60 new membership forms completed. Comments received analysed and used to inform the next steps for the group, at the public meeting on Thur 8th June, at St Mary’s Church Hall, starting 7pm, for 7.30pm. * Mar ’17 – Newsletter sent out to all registered members (see Newsletters) and briefings given to ‘Baldock Mail’ and ‘On Our Doorstep’. * 28 Mar ’17 – Received notification from NHDC re the creation of the BBPlan group. Details of the BBPlanning Group’s application is now on the NHDC Neighbourhood Planning Groups webpage, under Current Consultations. * 12 Jan ’17 – Application letter sent to NHDC, to register the Neighbourhood Plan area. This includes the parishes of Bygrave and Clothall as well as Baldock town. * 10 Jan ’17 – Initial meeting with Baldock Businesses to make them aware of the Neighbourhood Planning group. * Receive a boundary map for the full BBPlan area from NHDC – Baldock, Bygrave & Clothall Neighbourhood Planning area – the map includes Luffenhall, which is part of Clothall Parish area. * Incorporate Clothall into the group, forming the Baldock, Bygrave & Clothall Planning Group (still called BBPlan). * 10th Nov ’16 – Public open meeting – introduction to the BBPlan Committee. * 12th July ’16 – BBPlan Presentation at Baldock Councillors meeting. * 16th June ’16 – Public meeting to discuss the Neighbourhood plan. * 20th May ’16 – Initial meeting with NHDC Planning, to discuss the setting up of the Baldock Neighbourhood planning group, and approach to governance. Also request a boundary map for the BBPlan area. * 10th March ’16 – BBPlan Committee formed – see more details on the Committee page. * 25th Feb ’16 – Third public meeting to further discuss the formation of the Baldock Neighbourhood Planning Group. Draft Constitution and election of a BBPlan Committee discussed. * 1st Jan ’16 –Bygrave Parish Council incorporated into the Group, forming the Baldock & Bygrave Neighbourhood Planning Group (BBPlan). Draft BBPlan Committee formed. * 28 Sept ’15 – Initial exploratory meeting (at Tapps) between Baldock Society & Save Rural Baldock to discuss the possible formation of a Baldock Neighbourhood Planning Group.